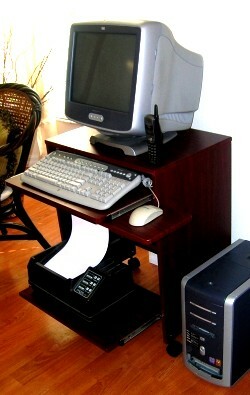 An elegant and compact laptop desk with keyboard tray and even a sliding printer shelf. This is a true space saving computer desk: only 23" wide and 16" deep. 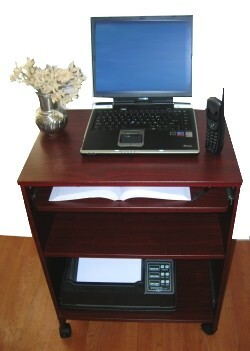 Very narrow, this small desk also includes a mouse tray, a bottom sliding printer shelf and a fixed shelf in between. Pull-out the printer shelf when you need the printer. Then just stow it away. The pull-out keyboard guarantees generous leg space, and allows the use of a mouse on the mouse tray. 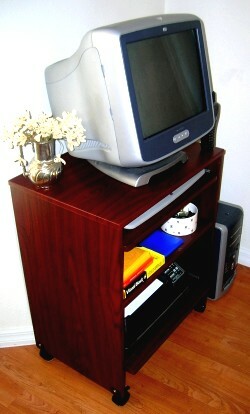 When used for as a laptop desk, the laptop is generally placed in the top shelf. The sliding keyboard shelf is used for writing space or for literature. 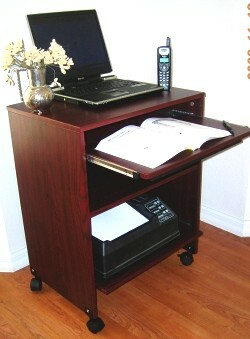 This is a very versatile small computer cart, compact enough to be used as a corner desk or to add to a table or regular executive desk to create a L-shape type of desk layout. 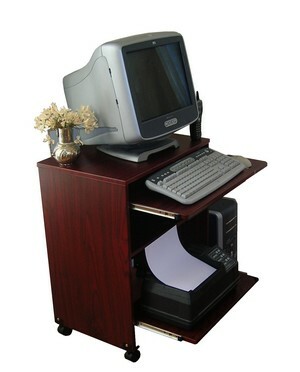 It is also used in small offices and even in medical exam rooms as an easy an affordable way to add an extra computer station. This small cart is easily portable, so you can move it to any room and even stow it away in a closet.